Gold, silver. 1st century CE. The originality and exceptional quality of this emblema dish make it one of the most important items of the silver treasure discovered in 1895 at Boscoreale, in a Roman villa buried by the eruption of Vesuvius in AD 79. The female bust in the center wears an elephant hide and is accompanied by a profusion of symbols whose interpretation remains uncertain: perhaps a portrait of Cleopatra, or her daughter, or an allegorical personification of Africa or Alexandria? In AD 79 Vesuvius erupted violently, destroying the civilization of the Naples region and, significantly, burying the cities of Pompeii and Herculaneum under a thick layer of ash. The bodies of the inhabitants were "fossilized" as they fled or fell, and numerous humble and precious artefacts were preserved and rediscovered in their original context during the eighteenth century. In 1895 excavations at a Roman villa at Boscoreale, on the slopes of the volcano, uncovered an exceptional hoard of silver treasure, including 109 pieces of silverware, grooming items and jewelry, stashed in a water tank by the owner before the eruption. This prestigious ensemble dates from the late first century BC and the early first century AD, when Roman metalworking flourished. 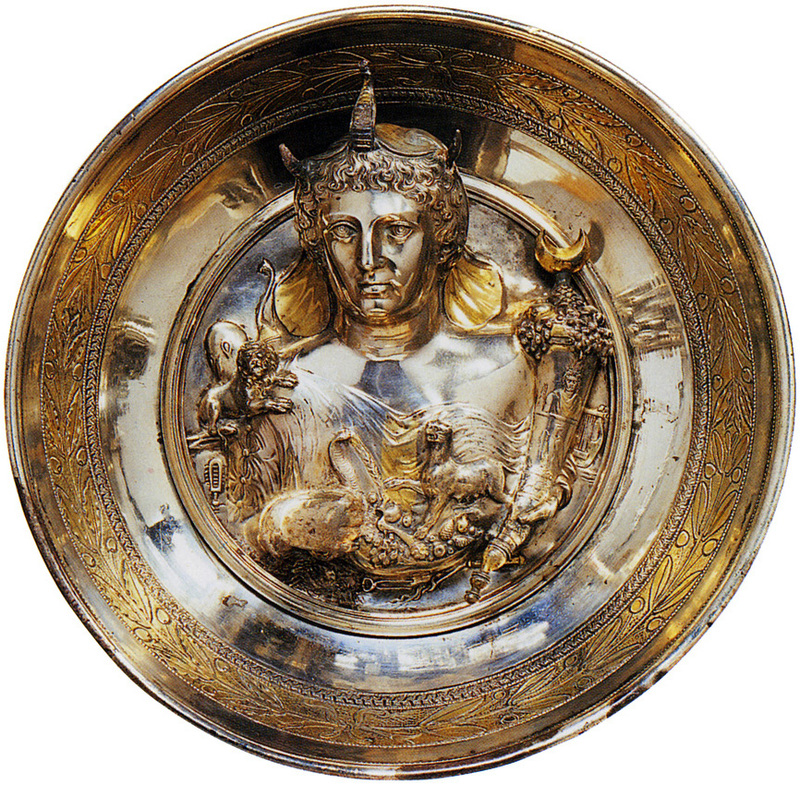 Of all the luxurious items found at Boscoreale, this large, partially gilded silver dish is notable for the originality and remarkable quality of its applied, repoussé and engraved decoration. The interior band of the dish is decorated with a garland of laurels and myrtle, laden with berries. In the center is a bust of a young woman wearing an elephant hide, holding a cobra in her right hand and a horn of plenty full of fruit in her left. The emblema is striking for the abundance of symbols accompanying the female figure. The bust is surrounded by numerous divine attributes: the bow and quiver of Artemis, the club of Heracles, the dolphin of Poseidon, the sistrum of Isis, the tongs of Hephaestus, the caduceus of Asclepios, the lyre of Apollo and the two-edged sword of Ares. Many questions still surround the interpretation of this emblema. The elephant hide, an allusion to the campaigns of Alexander the Great in India, often indicates a personification of a town or country; associated here with the lion and panther, it may identify the bust as an allegory of Africa or Alexandria. However, the careful rendering of the woman’s hair and her individualized features suggest a portrait rather than a purely idealized personification. The figure may indeed portray the features of the Egyptian queen Cleopatra VII, in the guise of an allegory of Plenty. The mistress of Julius Caesar and Mark Antony, Cleopatra was forced to commit suicide after the victory of Octavian at Actium in 31 BC. The uraeus (the snake on the figure’s crown) is an Egyptian symbol of divine power and royal dignity, and may recall Cleopatra’s death by snake-bite, after which Egypt’s fabulous wealth became part of the Roman Empire. Alternatively, the crescent moon on the horn of plenty could refer to Cleopatra’s daughter by Mark Antony, Cleopatra Selena, who is associated with the moon. Cleopatra of Egypt, from History to Myth, British Museum, Londres, 2001, p. 312, n 324Fr. Baratte, Le trésor d’orfèvrerie romaine de Boscoreale, Paris, Editions de la Réunion des musées nationaux, 1986, p. 77-81, p. 90A. Linfert, "Die Tochter, nicht die Mutter. Nochmals zur" Afrika ". Schale von Boscoreale ", in N. Bonacasa et A. Di Vita (éd. ), Alessandria e il mondo ellenistico-romano. Studi in onore di Achille Adriani, Rome, 1984, p. 351-358A. Héron de Villefosse, "Le trésor de Boscoreale", Monuments et mémoires. Fondation Piot, 5, 1899, pp. 39-43, n 1, p. 175-186, fig. 7, pl. 1. © 1996 White Star S.r.l. © 2004 Photo, text: Liberati A. M. Drevnij Rim: Istoriya tsivilizatsii, kotoraya pravila mirom. / A. M. Liberati, F. Burbon; per. s angl. K. Panas. — M.: OOO “Izdatel’stvo Astrel”; OOO “Izdatel’stvo AST”, 2004, s. 268. © Photo: R. N. M.
© 2014. Description: official site of Louvre.